VIDEO: P!nk to release new single through the "Alice Through the Looking Glass" soundtrack! VIDEO: P!nk to release new single through the “Alice Through the Looking Glass” soundtrack! As the release Disney’s newest romp through the wacky world of Wonderland, Alice Through the Looking Glass, approaches, we’ve been getting more and more excited with every little bit of marketing goodness the company releases. The most recent bit of awesomeness being an all-new single from pop megastar, P!nk. The track, which is the first single from P!nk in three years, will hit the airwaves on April 18th and a music video directed by Dave Meyers will debut in early May. It’s also the first time P!nk has written an original song for a live action feature film. 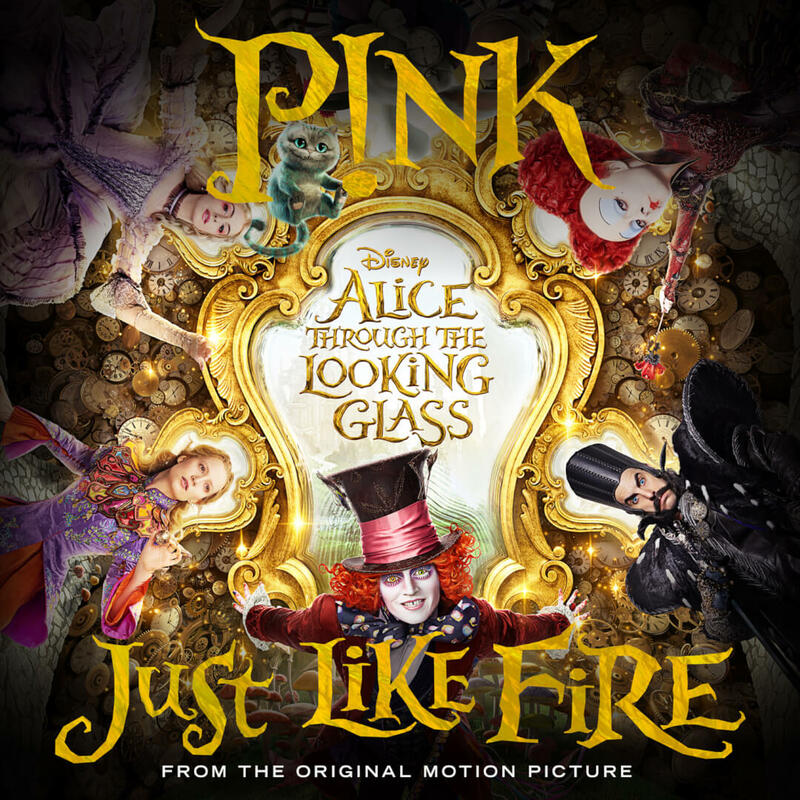 “Just Like Fire” was co-written by P!nk, Max Martin, Shellback and Oscar Holter and produced by Martin, Shellback and Holter specifically for the film. “Just Like Fire” will also appear on the motion picture soundtrack from Walt Disney Records featuring a score from four-time Academy Award nominee Danny Elfman. That’s one heck of a powerhouse team bringing this track to life. In Disney’s Alice Through the Looking Glass, Alice returns to the whimsical world of Underland and travels back in time to save the Mad Hatter. Directed by James Bobin, who brings his own unique vision to the spectacular world Tim Burton created on screen with “Alice in Wonderland,” the film is written by Linda Woolverton based on characters created by Lewis Carroll. The producers are Joe Roth, Suzanne Todd and Jennifer Todd and Tim Burton. John G. Scotti serves as executive producer. Alice Through the Looking Glass reunites the cast from the 2010 worldwide blockbuster phenomenon, including Johnny Depp, Anne Hathaway, Mia Wasikowska, Matt Lucas and Helena Bonham Carter and introduces new characters played by Rhys Ifans and Sacha Baron Cohen. Also back are the talented voices of Alan Rickman, Stephen Fry, Michael Sheen, Timothy Spall, Barbara Windsor and Paul Whitehouse, and they are joined by Matt Vogel. Alice Through The Looking Glass opens in U.S. theaters on May 27, 2016. Will you be in-line to catch this all new adventure in Wonderland? Let me know your thoughts in the comments!